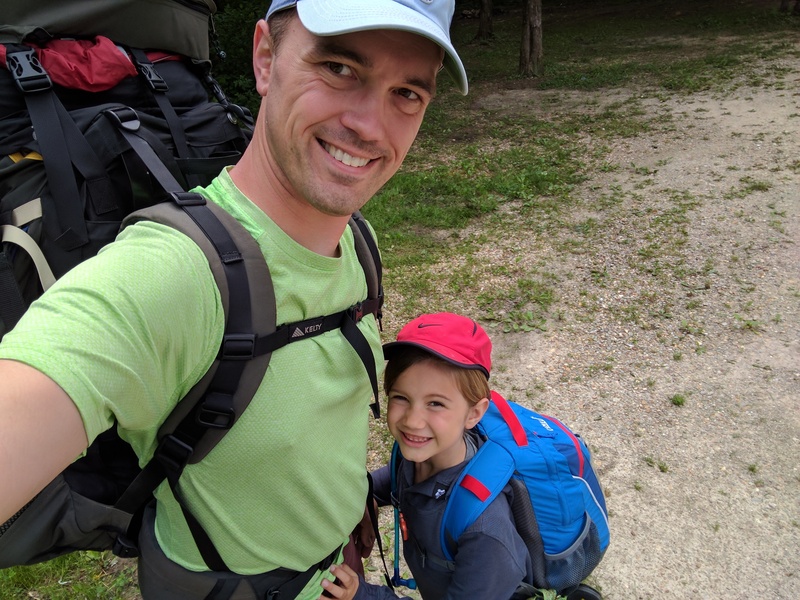 We own quite a bit of backpacking gear, much of which I’ve had since before Brooke and I were married when I’d go on trips over Spring Break in high school and college. After we had kids, obviously, it got a little more difficult to be gone for multiple days on trips without the family. 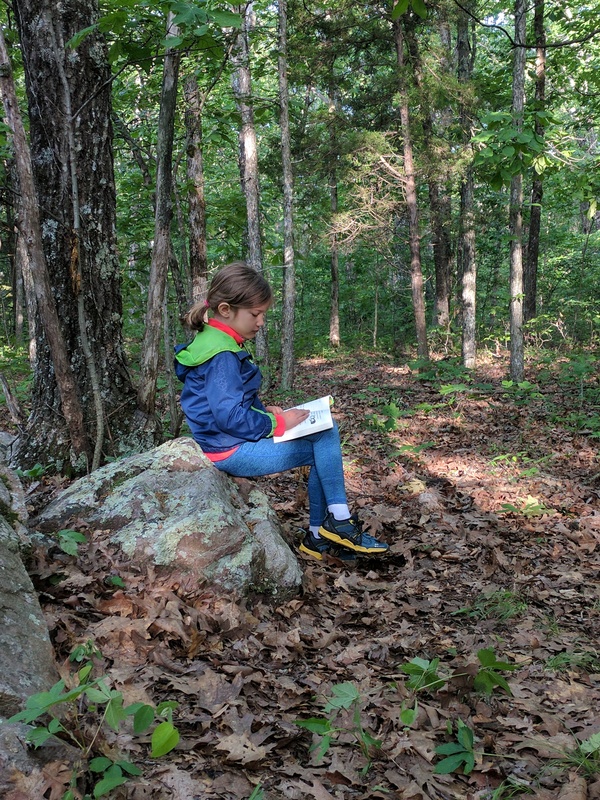 Thus, now that I’ve got a 7-year-old to indoctrinate in my interests, I thought this summer would yield an opportunity for a little daddy-daughter time out in the wilderness. 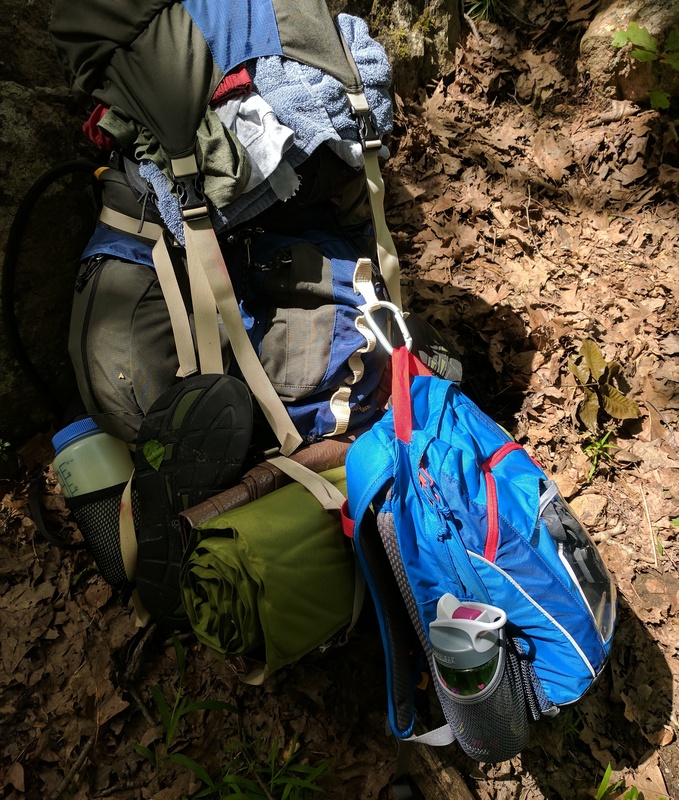 I hadn’t done much backpacking in Missouri, as most of my trips were to Tennessee and Arkansas (with a single trip to Colorado back in 8th grade). The trails I’d done in Missouri were relatively far south and didn’t have much access to water. 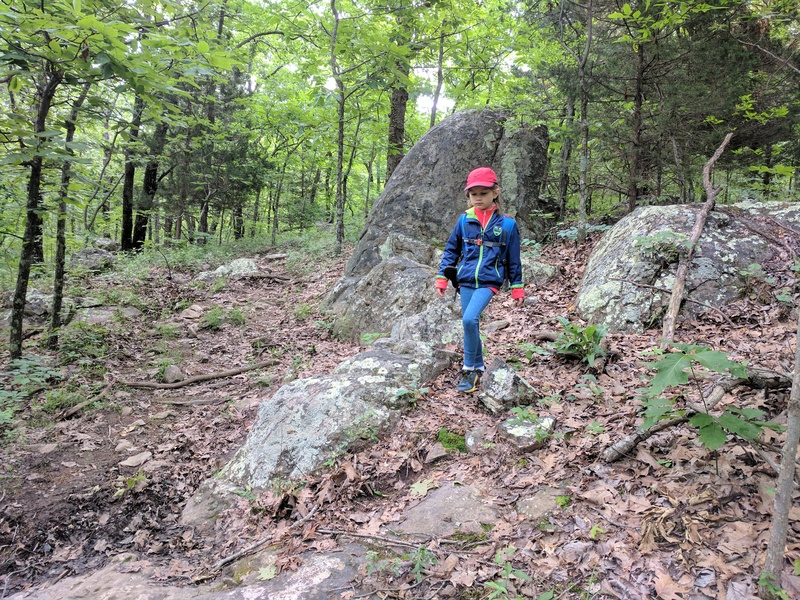 In searching for “beginner backpacking trails” that would be suitable for a 7-year-old first-timer, I came across the Bell Mountain Loop Trail near Salem, MO, as part of Mark Twain National Forest. 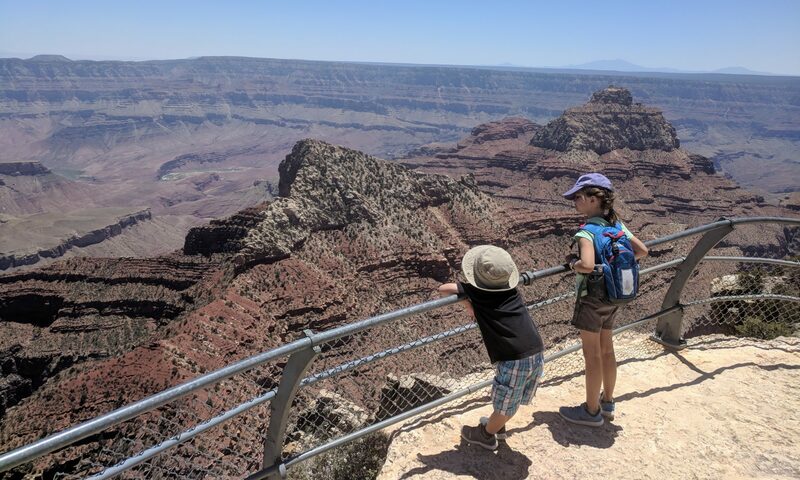 The trail represented a 10 mile loop that had good overlooks, had access to water at least at one point, and was rated as relatively easy for beginners. Things started out pretty good, really. In many ways, this is the most “in shape” I’ve ever been for backpacking, as the last time I did this, I was a good 30 pounds heavier. Meg, of course, had gone hiking with us in limited settings, but never with this length of time, or overnight in the wilderness. 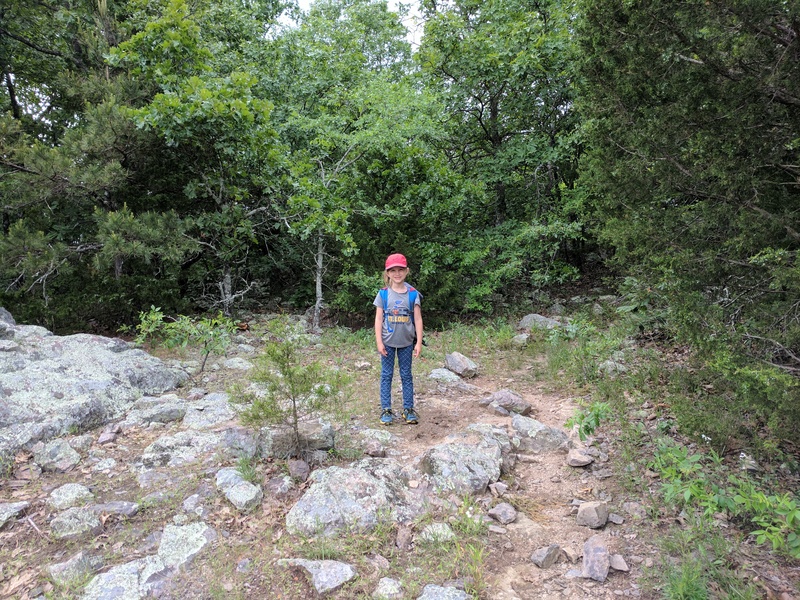 We got started on an Ozark Trail spur that would lead us to the Bell Mountain Trail Loop. The OT section was mostly a dry creek bed, which isn’t great to hike on if you’re an adult, let alone a 7-year-old. Meg and I had good hiking shoes on, so we were relatively fine, but it did get tedious, and we had to go slower than we otherwise would. Still, we continue onward and upward until we hit the Bell Mountain Trail (or so we thought…). We went for about as far as we could, but we were hoping we’d get to the main creek for our first night of camping, as it would provide some entertainment for Meg, and a solid water source to get us going the next morning. We kept going as far as we could, but it was getting darker and we had already gone a good 4 miles with no creek in sight. Meg was pretty tired (we didn’t start hiking until 4:00 pm, and there was a slight rain threat hovering about), and we were on a flat section of the trail that had some good camping spaces for our tent, so we went ahead and parked for the night. The first night went remarkably well! It dipped down into the low-50s overnight, but we were pretty warm in our tent. 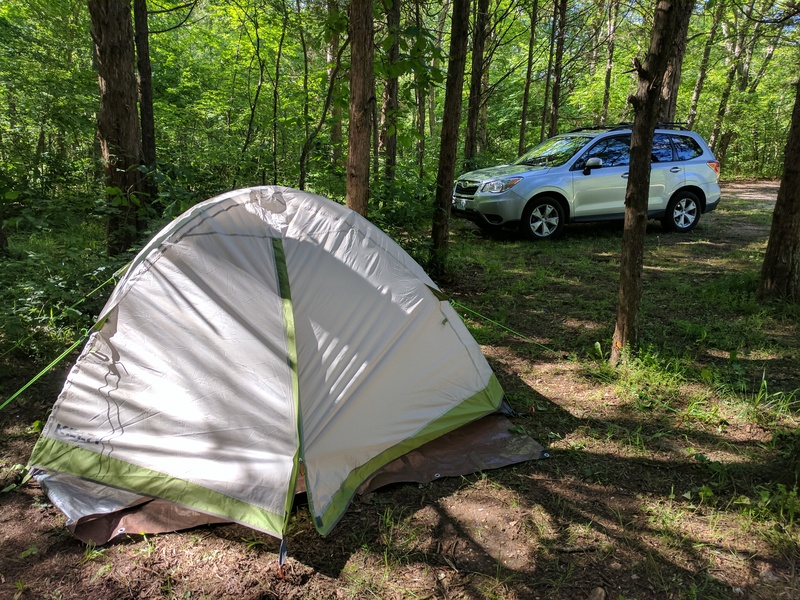 We bought a 2-person Kelty backpacking tent, as traditionally, I’d always relied on a hammock and a tarp – something that doesn’t work quite as well for a 7-year-old. The tent worked very well, so I think that purchase was well-founded. Anyway, we kept hiking the next morning and still never ran across the creek. We did spot a really nice overlook and took a few panoramic pictures with my phone. We did eventually spot a fire pit that we thought we recognized from our map, so we continued onward. Eventually, we’d gone so far that it was getting late in the morning and we still hadn’t found water. Not that we needed water right then, but we would need it for cooking later in the day, so I was getting a bit worried. I was also very confused by a fork in the trail that shouldn’t have been there, at least according to the map. Thus, we opted to turn around and start heading back. We figured that there were some ponds we had passed that weren’t ideal for filtration, but could still be used to keep us going until we could get to the car the next morning. We were also hoping to get moving relatively early the next day so we could hit up Heinrichshaus in St. James before getting to Marshall in time to pick up Calvin from school. Anyway, we kept going for a few miles and, at this point, I was keeping an eye on my LTE signal so I could try and download a Google Earth file that would show us where, exactly, on the trail we actually were. Basically, we saw that sign early in the trip that’s pictured at the top of this page, and it pointed to the left. We also knew that we needed to take a left to head toward the Fire Ring indicated by the star above, as it would take us down toward Joe’s Creek for water (and there were two creek crossings on the map). 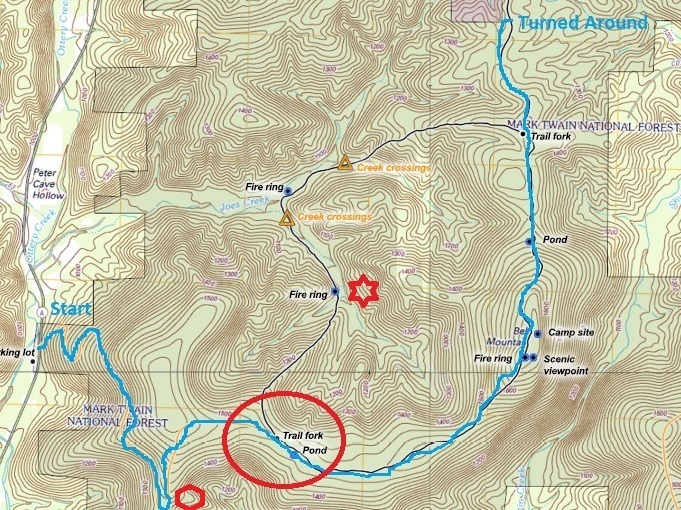 Well, we thought that sign was at the trail fork circled in red. Instead, that sign was way before that, at the hairpin turn indicated by the red hexagon. So, we took a left, but we were still on the OT spur and not actually on the Bell Mountain Loop yet. When we got to the real turnoff, we just kept on heading straight and didn’t notice that there was another trail heading off to the left just over our shoulders. Literally, there was a small orange flag that was practically impossible to see from the direction we were coming from. 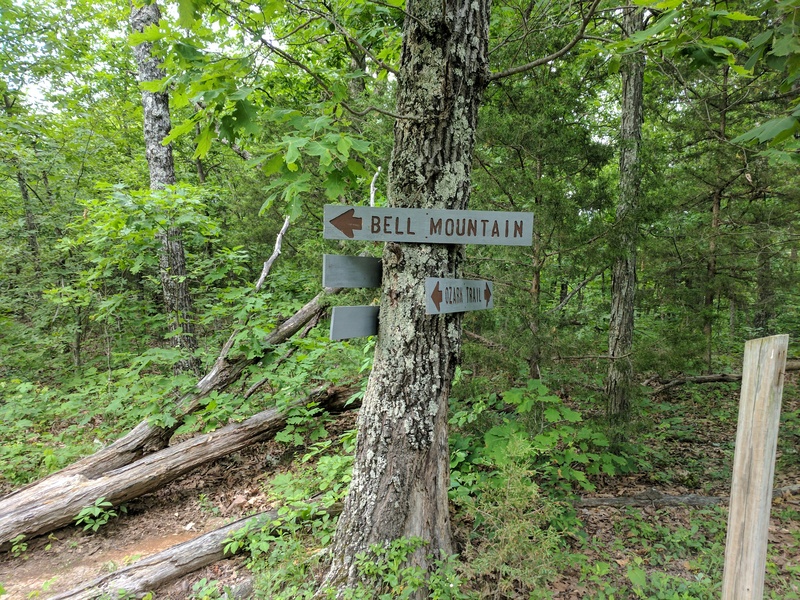 So yeah, instead of eventually seeing the fire ring indicated by the star, we instead saw the fire rings that were actually on Bell Mountain, and the scenic views they entailed. Also, based on my step tracker’s GPS, we ended up heading toward an entirely different parking lot before we turned around: the “extra fork in the road” we saw, we should have taken a left instead of a right. Of course, we thought we were heading clockwise on the loop, but instead, we should have been going counter-clockwise. Anyway, we had turned around, we figured this all out, and we kept trekking back to the car, knowing we wouldn’t cross the creek for water. We pushed it quite a bit and ended up going 10 miles that way. Meg was not happy about this. There was yelling, there was screaming. There was a lot of “I thought you said we were close!! !” Technically, we were “close,” but considering that Meg had to stop literally every 2 minutes because her feet hurt, it was taking forever. So yeah, we kept on going and eventually made it back to the car, where I had some water packed for our arrival. We also drove to a nearby creek passing so I could filter some more. It was quite a bit colder the next night, dipping down into the upper-40s, so that was a little less fun, but we still survived the night. Meg hobbled along for awhile and didn’t really want to walk at all after we got to camp, though she was fine by mid-next day. All in all, if you ask her about it, she’ll tell you she had fun with the camping aspect of the trip, but the hiking part wasn’t her favorite. I think I can convince her to go again someday, but we may want to shake these memories a bit before I try again! Ultimately, it was good to get backpacking again. If I have to wait until Calvin’s ready, I can live with that.